An alternative to poured concrete, pre-case foundations have many benefits. In Season Five of “Bob Vila’s Home Again,” the popular “Cabin in the Woods” project showcased a unique array of innovative building textiles and technology that saved time and money. One product that continues to generate interest is the state-of-the-art precast wall and foundation system developed by Superior Walls of America. The Superior Walls System consists of pre-cast, studded concrete walls. The ready-to-finish wall panels feature built-in plumbing and electrical access holes, and SWA crews can install an average system in about five hours, in almost any kind of weather. Pre-insulated with DOW Styrofoam and sealed with Bostik Chem-Caulk, Superior Walls are manufactured to National Standards and recognized Building Codes with 5,000 psi concrete. This eliminates the need for additional waterproofing or tarring. 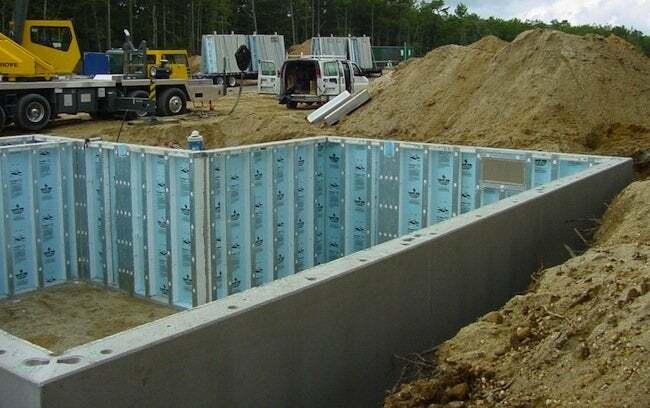 To enhance strength and durability, Superior Walls panels are manufactured with steel-reinforced concrete studs, rigid insulation, a reinforced top and bottom bond (footer) beam, and a 2-inch-thick concrete facing. The bond beams and concrete facing are cast in one continuous pour. They connect to the studs by encapsulating vertical rebars and galvanized hooks and pins that protrude from the top, bottom, and back of each stud. Pressure-treated furring strips are preattached to the inner face of each stud to provide a base to accommodate a variety of wall finishes. In addition 1-inch diameter holes are cast into each stud, allowing for the installation of wiring and plumbing. The top bond beam is perforated with pre-formed 1/2-inch holes approximately every 24 inches to allow the bolting on of pressure-treated sill plates. The system is delivered to the jobsite with a built-in footer and is installed on crushed stone sub-footer. The walls are pre-insulated with 1-inch DOW Styrofoam, with an R-5 rating. Additional insulation may be added to the 7-1/2-inch-deep wall cavity between the studs to increase the R-value up to R-26. A triple bead of Bostik Chem-Caulk provides a watertight sealant at the panel seams. Set 12 inches from the precast wall, a 4-inch perforated drain pipe assures a drier basement by collecting and channeling excess water away from the foundation. Superior Walls are completely custom made and designed to accommodate door and window openings. Panels are normally formed in lengths up to 16 feet and standard heights of 4-foot, 4-foot 8 inches, 8-foot 2-inches, 9-foot and 10-foot, and can be cast to virtually any shape for unlimited design flexibility. Factory-trained crews can install an average foundation system in about five hours, regardless of most weather conditions. Backfilling can begin as soon as the floor is poured and the subfloor is properly attached to the top of the wall system. The panels come to the job site already cured, so construction may proceed immediately after installation. 1. A 35 x 35-foot level area clear of overhead obstructions must be provided for the crane. 2. The basement must have an overdig of 24 inches at the bottom of the excavation. 3. The drainage system must be in place and functional. 4. Corner pins of the foundation must be clearly indicated. 5. Crushed stone must cover the entire floor area and be level to within one inch. 6. The builder must provide bracing materials for the wall system. Various lengths of 2x4s are preferred. 7. The site must be accessible for the delivery truck and crane. Check for mud, sharp turns, hills, bumps, trees, and overhead wires. 1. Mix calcium with the stone all the way down to the virgin soil in an area of at least 30 inches wide around the footing. 2. Cover the area with plastic sheeting or other waterproof and nonporous material, extending two feet on each side of the center of the footing. Place stones or other heavy material along the edges to prevent air from getting under the plastic blanket. 3. Scatter at least 6 inches of loose straw over the blanket — more in severe freezing conditions. These wintertime steps will keep the footing base stable and prevent weather-related delays. After the walls are placed, reapply the straw until backfilling is completed. Superior Walls can easily accommodate a simple and economical ventilation system to remove contaminated air and radon gas from the basement. Supplied and installed by the builder, a small in-line fan and piping system can be very effective. Special standard features of the SWA system add to the efficacy of this air exchange system. The cast concrete panels offer a very low permeability rate, which is even further enhanced by the factory-installed DOW Styrofoam insulation. The crushed stone foundation allows for the free flow of air from all points of the excavation into the exhaust system beneath the floor.